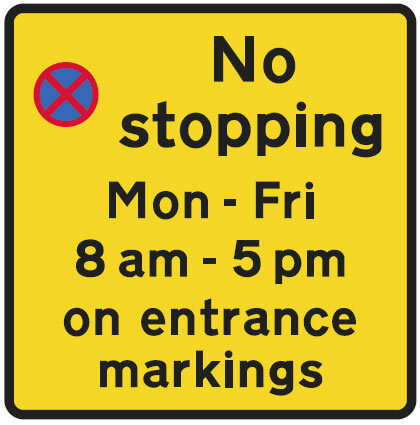 School Keep Clear road markings were initially introduced in the 1964 Traffic Signs Regulations. They were originally consisting of broken white lines that formed a box containing the words ‘School Entrance’. In 1975 these markings were changed to the current yellow zig zag lines with the words ‘School Keep Clear’ placed between the zig zag lines. Due to the success in helping to prevent accidents between motorists and children, these yellow zig zag lines are now seen at the majority of school entrances and exits throughout the UK. Yellow zig zag lines can also be found at the entrance or exits of hospitals, fire stations, police stations or ambulance stations and are used to indicate the length of road where you should not wait, stop or park a vehicle. Where there is an upright sign, there is a mandatory prohibition of stopping during the times shown. Yellow and white zig zag road markings are placed to show that the area must be kept clear to allow an unrestricted view for approaching drivers and riders or children wanting to cross the road. Motorists are legally permitted to park on the yellow zig zag lines outside of the hours marked on the signs, unless other road markings indicate otherwise (see below for further details). Yellow zig zag lines without signs to accompany them do not have a Traffic Regulation Order giving the local council powers to issue PCN fines. Therefor it is technically legal to park on yellow zig zag lines without signs at any time. However, these zig zag road markings are placed there to advise motorists not to wait or park on these lines for the safety of children and although the local council do not have the powers to enforce penalties, police frequently issue tickets in such cases.Tickets are issued on the grounds of causing an obstruction to either other motorists or pedestrians and not for parking on the yellow zig zag lines directly. A yellow zig zag line with a single yellow line indicates two sets of instructions must be followed. If the yellow zig zags have a time plate sign as described above to restrict parking and also the restriction placed by the single yellow line. Single yellow lines have parking restrictions at certain times of the day at certain days of the week. These are detailed by either road-side signs or are part of a Controlled Parking Zone (CPZ). A CPZ is an area with controlled parking instead of a single street. All possible entrances into the CPZ area have signs telling a motorists they are entering a CPZ and restrictions that apply. Restrictions may be in force for the yellow zig zag lines and restrictions for parking due to double yellow lines. Double yellow lines have limited restrictions. Disabled blue badge holders can park for up to 3 hours in areas where no loading restrictions are in place. Motorists and commercial vehicles may unload or load vehicles for a prescribed time outside of restricted loading areas and motorists may stop to drop off or pick up passengers providing there are no stopping restrictions in force. By default, double yellow lines have the ‘no waiting’ restriction applied 24 hours per day unless otherwise specified by signs. See no stopping and no waiting for an explanation of the both regulations. Penalty Charge Notices (PCN) are issued to motorists that do not conform to the rules restricting them from waiting, stopping or parking even to pick up or drop off children to school on yellow zig zag lines if restrictions are in force. Civil Enforcement Officers issue PCNs if restricted parking is dealt with by local councils. The vast majority of parking or waiting fines in the UK are now enforced as a civil (local council) rather than a criminal (police) matter. A PCN doesn’t result in a criminal record or points on a licence if dealt with by the council. In areas where the local authority doesn’t have civil parking enforcement powers parking is enforced by the police or police-employed traffic wardens who will issue a Fixed Penalty Notice (FPN) enforced through the criminal justice system. Fines vary due to the location of the offence. Stopping in a restricted area outside a school will result in a higher fine. The fee is halved if paid within 14 days and you have 28 days to pay or challenge. Regulatory yellow zig zag lines that have restricted parking enforced by local councils or the police must have a sign to accompany the lines. When you feel confident in your ability to understand road markings, take the free road markings theory test quiz and test your knowledge. See Road markings theory test quiz. I pulled over to allow oncoming traffic to pass out side my child’s school whilst on the yellow zig zag lines. I didn’t open my door or put on the hand brake or drop any one off. Yet I have received a fine. I would assume as they are marked ‘School Keep Clear’, that you did not keep clear of the markings and stopped on them. If you feel that you had no alternative but to stop on them, you could contest the fine. I opened the door and my children jumped out of my car, I was not parked or stopped on the zig zag lines but the middle of the road. A community police officer said I was not allowed to stop near the line either ? Is that right? Technically the law applies to the road markings only and only if the markings have a Traffic Regulation Order applied to them (you’ll see a sign if there is). Though you do need to consider, law or no law that this area is a place that children, often difficult to see and inexperienced road users frequently cross. Drivers that stop to pick up and alight passengers in these areas are particularly hazardous to the children. I don’t know why it’s not mandatory to make it illegal to park on all zig zag lines outside of schools, but it’s only the zig zag lines that have a sign (Traffic Regulation Order) that can be enforced. Having said that, if a driver is being a general nuisance and hazard, they could be ticketed with obstruction, driving without reasonable consideration for other road users etc.